THE FOURTH REICH > Plum Island - inspired by Nazi science? What do you all think of the weird science that goes down on Plum Island, NY? Plum Island is the location of a deadly government conspiracy in the 2014 novel, The Montauk Monster by Hunter Shea. HOW MUCH OF PLUM ISLAND'S MODERN EXPERIMENTATION IS INSPIRED BY NAZI SCIENCE??? Another interesting book to read about Plum Island is Lab 257 by Michael C. Carroll. The book explains how Plum Island was started and what it morphed into. It also explains how the first cases of Lyme Disease were documented right across the bay from Plum Island. I live uncomfortably close to the CDC in Atlanta. It has been speculated that MRSA (the flesh eating bacteria that is resistant to most antibiotics) was developed there. I work in a doctor's office north of Atlanta. We have seen more than our fair share of people infected with MRSA. It is awful to see the damage done by that infection. Kathy wrote: "Another interesting book to read about Plum Island is Lab 257 by Michael C. Carroll. The book explains how Plum Island was started and what it morphed into. It als..."
Being on the inside of the medical industry you obviously have gained first hand knowledge of these things. Wesley wrote: "Sergei Popov is a scientist and bioweaponeer formerly in the Soviet biological weapons program. He defected to the West in 1992 and now lives and works in the United States. And what about pre-Popov - Plum Island goes right back to Paperclip, right? It's essentially Nazi science brought to the West, correct? Wesley wrote: "Plum Island was basically run by Dr Erich Traub, who was one of the top Nazi bioweaponeer's brought over during Paperclip...."
Is there a UK equivalent of Plum Island? Also, are you aware of Operation Matchbox? I assume you are. 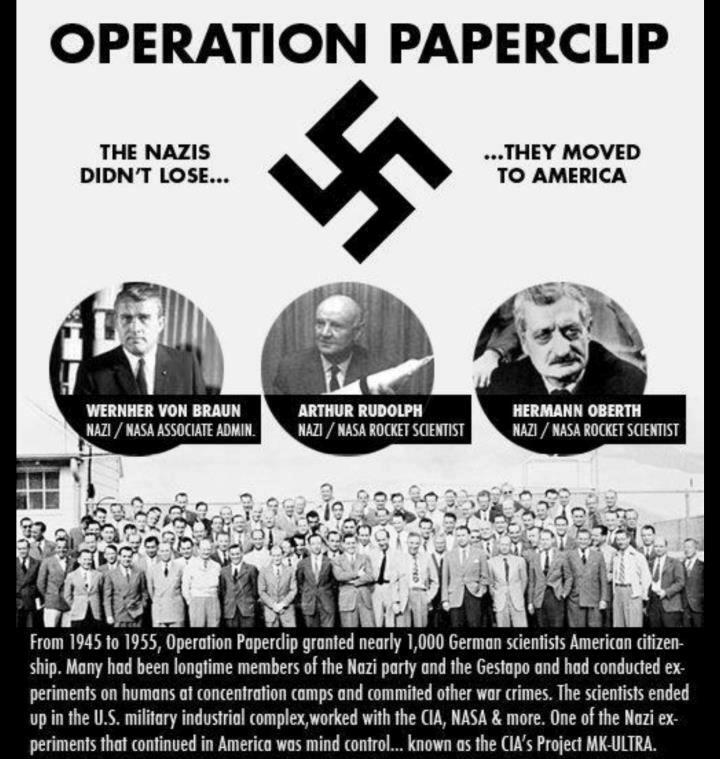 That was Britain's equivalent of Operation Paperclip in which they quietly ushered in a lot of Nazi scientists post WW2. Amazing info in those articles Wesley. The public needs to be made aware of this dark history. Isn't Lyme Disease the one you can develop by getting bitten by a tick? Edward wrote: "Do any government "scientists" work on anything that might possibly enhance life? By the way, the Hitler-era Nazis must be all dead by now. These goings on are now someone else's call." The Paperclip Nazi scientists' legacy lives on, I'm convinced. It certainly all might be true. And probably it is. Without being there, without experiencing, it is most difficult to declare. The truth is malleable within the mould of perception - so easily we are brought to doubt. But fiction is supreme. There need never be the fear of pain cowing our intellects in a fictional world. The great prophets, surrounded by common fools! Surrounded too by armed fools and powerful fools. Oh, how they so closely measured their poetic warning words. "...Unloaded onto a tugboat (which looked like a dinghy next to the massive freighter) along with its three chaperones was a shiny hinged metal box—glistening in the bright sunlight, stenciled PROPERTY OF THE U.S. GOVERNMENT on all sides. The tugboat slowly chugged to Plum Island harbor, where it put its precious cargo ashore. Soon after, other viruses, similarly sealed, made the journey to Plum Island, hailing from the far corners of the globe—North and South Rhodesia, Nanking, Tokyo, India, Thailand, Palestine, Iran, Pakistan, Turkey, Egypt, Kenya Colony, Nakuru, Kabete, South Africa, Orange Free State, Entebbe, Nigeria, Sierra Leone; from nearer reaches—West Germany, Italy, France, Great Britain, Mexico; and even from within the nation’s borders—Fort Detrick and Cornell University (courtesy of Dr. Hagan). Each bug was frozen inside corked vials or ampoules, tucked in hinged metal canisters, and carefully packed in boxes bound with padlocked iron straps. The boxes were then locked in a dry ice cabinet, which itself was inside a bombproof vault. “I have trouble getting into the stuff myself,” said Cottral, who held all dominion over the germs, speaking with the New York Herald Tribune in 1954." How they got their hands on the viruses reads like a Ian Fleming novel. “It was sort of cloak-and-dagger business,” recalled scientist Dr. George Cottral, Plum Island’s first biological security officer. Shahan picked up the hot, live rinderpest from the Army’s top-secret PROJECT 1,001 (named after the famous Arabian Nights tales) deep within the Kenyan jungle. He brought it with him to Great Britain’s Pirbright virus laboratory near London, where he met up with Colonel Mace and Dr. Cottral. There the trio bought bovine and guinea pig tissues infected with six types of sixteen different strains of foot-and-mouth disease virus, forking over to the lab’s director a U.S. Treasury check for $5,000. Federal law forbade the virus on mainland United States soil. So after overseeing its intricate packaging, Mace, Shahan, and Cottral rode back with the test tubes and ampoules across the Atlantic on a U.S. Navy freighter. They were placed carefully inside a heavy canvas bag, padlocked inside a strong wooden box, placed in a stainless steel box. The men kept it within their sight the whole trip. In the deep waters of Gardiner’s Bay, just south of Plum Island, the freighter’s screws came full stop and set anchor. Unloaded onto a tugboat (which looked like a dinghy next to the massive freighter) along with its three chaperones was a shiny hinged metal box—glistening in the bright sunlight, stenciled PROPERTY OF THE U.S. GOVERNMENT on all sides. The tugboat slowly chugged to Plum Island harbor, where it put its precious cargo ashore." The laymen tried to figure out what they had contracted on Plum Island, and pleaded for answers from their North Fork doctors, family general practitioners better suited to bandaging knee scrapes and prescribing antibiotics for ear infections. “You are exposed to so many viruses over there,” says Shine from experience. Being on the front lines of health care (primary care an hour north of the Center for Disease Control in Atlanta, GA), we see some scary things come through. Primarily MRSA, the flesh eating disease, which has become even more common since my original post last year. As mentioned above, there is no readily accessible communication from the CDC as to what is being worked on or stored there. We are never informed if there are safety violations (small pox stored in forgotten file cabinets --it really happened). You can read their web site on your free time but when you have a waiting room full of people . . . Just a joke, is it any wonder that the TV show The Walking Dead takes place just a 1/2 hour from here. Kathy wrote: "Being on the front lines of health care (primary care an hour north of the Center for Disease Control in Atlanta, GA), we see some scary things come through. Primarily MRSA, the flesh eating diseas..."
Great insights, Kathy, thanks for sharing. The town of Lyme (where Lyme disease was first discovered) is close to Plum Island also. And yet, there’s still an unexplained initial outbreak of Lyme disease occurring nine miles away from an exotic germ laboratory with quarter-inch holes in its roof—a lab busy breeding hundreds of thousands of ticks including a tick known to spread Lyme disease with African Swine fever virus cross-contaminated with who knows what—that is worthy of a real, scientific investigation. And a little-known outbreak of West Nile virus, that killed horses on the doorstep of Plum Island weeks before humans first contracted the illness many miles away in New York City in August of 1999, also deserves a real, scientific investigation. After reading this book (I believe 2014), I was under the impression that this facility was closed down and moved to Kansas due to concerns of it being too close to a huge population base (New York City). However on the US Dept of Agricultural website, ars.usda.gov, it lists one person at the Plum Island Animal Disease Center with 3 location support staff, and 41 foreign animal disease research staff. Interesting. Maybe it is an old listing . . . Though it says last modified 6/22/2016. Kathy wrote: "After reading this book (I believe 2014), I was under the impression that this facility was closed down and moved to Kansas due to concerns of it being too close to a huge population base (New York..."
he first book to expose the true story of America's secret program to create biological weapons of mass destruction. From anthrax to botulism, from smallpox to Ebola, the threat of biological destruction is rapidly overtaking our collective fear of atomic weaponry. In an era when a lone fanatic could wipe out an entire population with the contents of a small vial, the specter of germ warfare has moved into a prominent position in the public's mind. This riveting narrative traces America's own covert biological weapons program from its origins in World War II to its abrupt cancellation in 1969. This project, at its peak, employed 5,000 people, tested pathogens on 2,000 live human volunteers, and conducted open-air tests on American soil. The U.S. government appropriated research from Japanese experiments on Chinese civilians, thus benefiting from one of the twentieth century's greatest atrocities; sprayed its own cities with bacterial aerosols; and stockpiled millions of bacterial bombs for instant deployment. Yet, surprisingly, almost nothing has been published about this project until now. In light of America's increasing surveillance and condemnation of foreign biological weapons programs, this exposé of America's own dangerous Cold War secret is both fascinating and shocking. In February 2001, Australian scientists announced that they had inadvertently killed dozens of mice by making a virus that had crippled their immune systems. At first the scientists informed only the Australian government and military about the experiments, which were done in 1998 and 1999. But after intense debate, they decided to publicize their findings. Others needed to know of the potential danger in case such discoveries were turned against people. They said they had produced their inadvertent killer while trying to make the mice infertile as part of a pest-control project. The agent they were experimenting with was a virus widely used in lab studies— mousepox, a cousin of the human smallpox virus. The scientists had inserted into the virus a mouse gene that controls the production of interleukin-4, a signaling molecule that helps the immune system fight off invaders. The goal was to make the immune system of a pregnant mouse so hypersensitive that she would reject her own eggs as foreign. The scientists did this by infecting the mice with mousepox viruses that had been modified to carry the interleukin-4 genes. The result was a surplus production of this powerful immune system controller. But when the scientists infected the mice with their designer virus, the mice not only became infertile, they died. The scientists were surprised to find that even mice vaccinated against mousepox died. Birth control had become life control. Because people also have the interleukin-4 immune system gene, the team realized that creating a surplus of that substance in humans might kill them too. Worse, the Australians realized, a rogue state or terrorist group might be able to achieve this result with smallpox, the devastating human virus. Just as the super-mousepox had defeated the mousepox vaccine, so might genetically enhanced smallpox defeat the human vaccine, the only existing protection should the disease re-emerge. Feliks wrote: "Yep. It's near me. Is Plum Island still operational? I can't speak to that. I can tell you pretty confidently though, that its still owned by the same owners. Besides, "what's wrong with animal research?" Feliks wrote: "I can't speak to that. I can tell you pretty confidently that its still owned by the same owners. Besides, "what's wrong with animal research?"" Please update if anymore weird creatures wash up on the beach there! All the waterways around NY are fraught with peril for unwary boaters. Most New Yorkers are weekend-boaters who just aren't experienced with water. Foolhardy in that regard. Also, how many times does it take per year that a bather gets swept out to sea by undertow, before people get the message? Its as if we're so conditioned to constant warnings about every-little-thing; we tune it out and just sally forth. I feel less safe now that Plum island is in Kansas. when it was an island there no was the imaginary idea that it could be contained but now there isn't even that anymore. It does seem odd to relocate such a site to mainland America. "The National Bio and Agro-Defense Facility (NBAF) is a planned United States government-run research facility that will replace the 1950s-era Plum Island Animal Disease Center in New York, which is "nearing the end of its lifecycle and is too small to meet the nation’s research needs." The NBAF will be operated under the authority of the U.S. Department of Homeland Security (DHS), with the U.S. Department of Agriculture’s Agriculture Research Service (USDA-ARS) and Animal Plant Health Inspection Service, Veterinary Services (USDA-APHIS-VS) as primary research partners"
Kelly wrote: "Isn't Lyme Disease the one you can develop by getting bitten by a tick?" Sometimes there is more truth in fiction than non-fiction these days. For instance, the TV series "Stranger Things," which takes place in the early to mid 1980s, was originally called "Montauk." Essentially, I believe, this show is about how those who rule us are involved in “stranger things” than most of us can fathom, where the dark, disturbing agenda and activities of the occult elite is directly contrasted with the innocence and playfulness of children. In this show, I think the "Upside Down" (a much darker, colder and Demogorgon infested alternate dimension existing in parallel to the human world) symbolically represents the beastly, monstrous side of the “scientific” experiments of the occult elite and/or the shadow government--that exists no matter who is in office and that evolves entirely out of public view-- partake in programs, experiments, and missions, while controlling the country’s entire resources and networks. I believe the Demogorgon represents the satanic elite that feeds on the blood of innocents, abducting children and using them to gain power. In "Stranger Things," the MK programming site and the gateway to the ‘Upside Down’ are located in a National Laboratory of the U.S. Department of Energy. "The events on Long Island have come to be known as The Montauk Project. This phrase refers to a series of top-secret experiments in mind control, time travel, psychotronics, and the creation of black holes. These experiments were based out of an old Air Force radar station, or more accurately, in a vast complex hidden in the earth beneath this radar station. According to legend, the base actually lost its funding in the late 1960s because the radar technology was obsolete, but was open until 1983. The area is now a New York state park, but the buildings are intact and radar equipment remains standing. Also, from what I learned, what is really strange is that while the government gave the land to the state, it still owns the land beneath the base. Apparently there are many levels beneath ground that were used for research and the base was really a cover-up. Some people say that is absolutely documented that there is a subterranean city beneath the base that is still being used today by secret branches of the military. People say that the radar equipment was built as a cover up so that the military could conduct experiments in time travel and mind control and this is what all the electronics equipment was for. The Montauk Air Force Station was said to have carried out numerous terrible experiments in cooperation with many research laboratories on Long Island. Apparently, this base was also in cooperation with Mitchell Air Force Base on Long Island." Dr. Traub was not a low-level Nazi player by any means, but in fact, he was a high-ranking SS officer during Nazi Germany. To illustrate his place in the hierarchy- Adolf Hitler was the party leader. Under Hitler, Heinrich Himmler headed the SS. Among several under Himmler in, there was Reich Health Leader Leonardo Conti, and under him, Kurt Blome was the head of the Nazi's Biowarfare program. Under Blome, was Erich Traub- 4th in the chain-of-command to Hitler. "...Dr. Little, described Traub as a "domineering German and a surly type of individual with a violent temper." Another colleague, Dr. John Nelson found that despite long training in the care of animals, [Traub] went out of his way to be cruel to animals." Traub was also part of an FBI investigation in 1942 where there were large 1000 gallon gas tanks being installed underground on a farm residence next to Frank DuPont. A man said to be a Dr. Eugene Traub from New York. But there is a possibility this may have actually been Erich Traub, since he did work with animals and the USDA, studied at the Rockefeller institute, would have probably known Frank DuPont, and possibly had a summer home in America even while working for the Nazis, as they welcomed him before and after the war. “Even more disturbing are the records of the Nazi germ warfare scientists who came to America. They experimented with poison ticks dropped from planes to spread rare diseases. I received some information suggesting that the U.S. tested some of these poison ticks on the Plum Island artillery range off the coast of Connecticut during the early 1950’s. I explored the old spies’ hypothesis that the poison ticks were the source of the Lyme Disease spirochetes, and that migrating waterfowl were the vectors that carried the ticks from Plum Island all up and down the Eastern Seaboard. Most of the germ warfare records have been shredded, but there is a top-secret U.S. document confirming that “clandestine attacks on crops and animals” took place at this time. The Lyme Disease outbreak in America was monitored secretly under the cover of a New England health study. “At least six outdoor stockyard tests occurred in 1964-65. Stimulants were sprayed into stockyards in Fort Worth, Kansas City, St. Paul, Sioux Falls, and Omaha in tests determining how much foot-and-mouth disease virus would be required to destroy the food supply.